A good song is just an emotion away. 4 Strings, a Dutch trance duo consisting of producer Carlo Resoort and DJ Jan De Vos (who performs under the name DJ 4 Strings), have created numerous trance hits over the past two decades, perhaps most notably during their earlier years with such classic dance hits as "Let It Rain", "Sunrise", and the over-remixed "Take Me Away". Though they haven't put out an official album in ten years at this point, they still regularly churn out new tracks like clockwork. Sometimes they're quite catchy, other times more on the safe and generic side. But when they teamed up with Carol Lee, known for her vocals in the Dutch indie group Bettie Serveert (yep, hadn't heard of that prior), they produced only one thing: pure musical gold. In this package, we get an astonishing ONE track! No remixes, not even a radio edit of sorts! Just the all-encompassing Original Mix is what we need. Starting right off with a pulsing beat and popping bassline to get us going, Carol Lee starts off singing about how the touch and the cutting remarks of her ex-boyfriend (or ex-girlfriend — we don't judge) still linger despite him moving on a long while back. My only complaint about the song lies here: there's no variation in the instrumental portion here! It's a bit too monotone here, but thank goodness Carol can pull it along. But it's the chorus that truly brings the bacon home, and it also gives Carol a chance to actually show off some vocal chops, rather than keeping it fairly low key as in the one and only verse. And the melodic accompaniment, though it's quite simple (very much in the style of 4 Strings, as they've never made complex melodies), couldn't be more uplifting to harmonize with the now-powerful Ms. Lee. I could probably listen to the part of the song over and over... and over... and over again. The instrumental goes headstrong before a Ms. Lee reprise and the breakdown. Upon first hearing this track, I knew I had encounter exceptional euphoria. If you declare yourself a fan of trance, you owe it to yourself to give this one a spin. 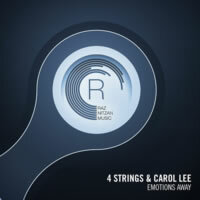 Emotions Away is easily one of my top trance tunes of 2016, and the year's not even over yet. It's just that good to listen to.